Does Safety get thought about when marketing? As Christmas fast approaches, the Retail Sector is under increasing pressure to make sales, with vast quantities of stock arriving and hopefully turning over. But as shoppers, do we ever think that it makes our shops increasingly less safe? Are we at greater danger in the Festive Season? Just how safe are our shops anyway? Do they have a ‘safety culture’ when dealing with their customers? 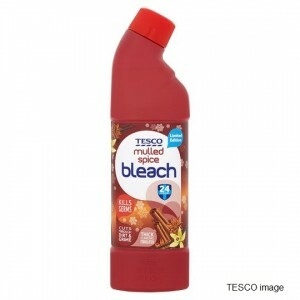 A few weeks ago, some of the Press carried the story of the Tesco Limited Edition Christmas Bleach; somebody thought it a great idea to have it smelling of Mulled Spice. But is that any more dangerous than the regular offerings of Citrus bleach? It’s still in a child resistant capped bottle. Two years ago, ASDA were forced to place a Customer Notice outside their stores and on their website, retracting advice given in their Christmas ASDA magazine. One of their ‘Tips for Christmas’ had included the suggestion of spraying your Christmas tree with hairspray to “glue” the needles together to stop them dropping on the floor. In late November 2014 they stated “We recognise this is a bad idea and would urge people NOT to spray their Christmas trees with hairspray as this poses a fire risk.” No Kidding! That advice came from the 1960’s. Does Safety get pushed aside at busy times? But apart from such mishaps, there is the overall pressure of the season, for shops large and small. There is the tendency to use that narrow corridor for additional stock; after all, who ever goes down there? Floor space is valuable, whether on the shop floor or in the stockroom. What does it matter if we keep the 30 Christmas Trees in the Escape Route; we never go down that pathway anyhow? What has been more of a surprise to me was the attitude I recently encountered from the head office of a major retailer. On visiting a store which is not in my local area, I was glancing around at the basic safety arrangements, after all they do say ‘every day’s a learning day’. 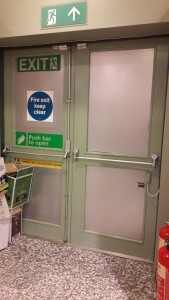 I noticed that one of the Fire Exit doors at the rear of the store leading into the stockroom carried a number of contradictory signs, such as ‘Fire Exit’ and ‘Staff Only Keep Out’, but significantly the doors opened only by PIR sensor and opened toward anyone approaching from store. Thus in a power cut, how could they be opened? Deciding that it would be more likely to get a sensible response from the Head Office than working my way up the store hierarchy, I sent them an email from my company account, thus making it clear that they were dealing with a H&S Professional rather than just any ‘man-in-the-street’. I further explained that since I was so concerned at the level of risk to people’s safety, if I did not receive a suitable response within a reasonable time-scale, I would be forced to contact their local Fire & Rescue Service. On forwarding this email chain to the Fire Service, I received a response within hours, stating that they had visited the store and discussed the situation with the Duty Manager. 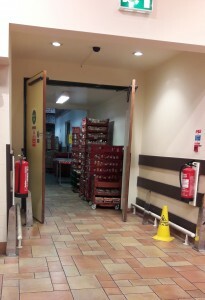 The store was to conduct a suitable and sufficient Fire Risk Assessment and if they concluded that (given the numbers of people that may use the store and the travel distances involved) they required that doorway to be an Emergency Exit, it must operate in the opposite direction, i.e. into the stockroom with the flow of evacuating persons. So my professional integrity and reputation were intact, but the fact remains that this doorway had been like this for many years, possibly decades since the store was built. The safety of the general public and their staff has been at risk for all that time. Given that they would understandably not wish to kill power to their freezers and coolers, it’s not an unreasonable assumption that when conducting Fire Drills, they always go through the motions, with the store empty and all power working. I doubt they have ever thought to conduct a drill having killed the main lighting and the PIR to that door. Thus they have basked in blissful ignorance of a likely scenario for a real evacuation, a crush of people trapped in that small area. But what’s really concerning is the arrogance of the response from the Head Office, allegedly from the head of their Corporate Health & Safety. It wo uld appear that the warnings to all in the retail trade from the 2007 New Look fire in Oxford Street, which resulted in a £400,000 fine in 2009 have not been learnt or have dropped from corporate memory. New Look were fined £250,000 for failing to have a ‘suitable and sufficient’ Fire Risk Assessment plus another £150,000 for failings in their staff training. There was an additional £136,000 in costs. Only 150 people were in that store in April 2007; how many are likely to be in any large store in the next few weeks? A reasonable size supermarket might have 450-500 car parking spaces; if the car park is full there could easily be some 1,000+ people inside, including harassed family groups with several children in tow. Update Autumn 2017 – The store in question has undergone several months of refurbishment since the Spring; the doors in question now operate the other way around, to facilitate their use in an emergency.